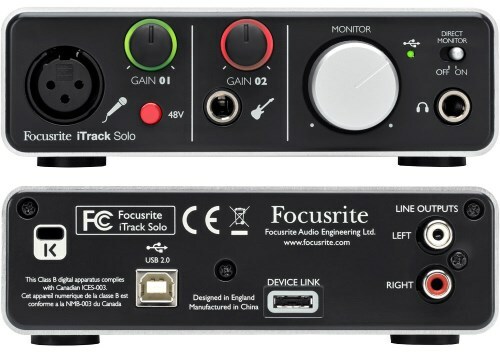 A good entry-level audio interface for iPad, Mac OSX, and Windows with a professional mic pre-amp. With both a regular and 30-pin USB connection this is an ideal interface for iPad users. It has the same high quality A/D converters and microphone pre-amp as Focurite's more expensive models, and it's perfect for recording vocals and electric guitar at the same time. It is suitable both for recording demos and tracks for commercial release - it's convenient and portable and doesn't require a separate power supply because it draws its power from the USB connection. The green light around the gain knobs will flash red if the input volume is too high and the inclusion of phantom power on the microphone input means you can use high quality condenser mics to record your vocals. It doesn't have a lot of extra features - it doesn't come with any free software and there are no built-in effects, but for the price this is a perfectly acceptable and highly portable adapter you can use to capture your ideas anytime, anywhere. NB: If you need to record with two mics at the same time then we recommend you get the Scarlett 2i2 instead. It's available online at Sweetwater.